The natural color and radiance of pearl is elegant and eye-catching, paired with lots of zircons to represent a super star like Audrey Hepburn. This piece is name after Audrey Hepburn in her honor. 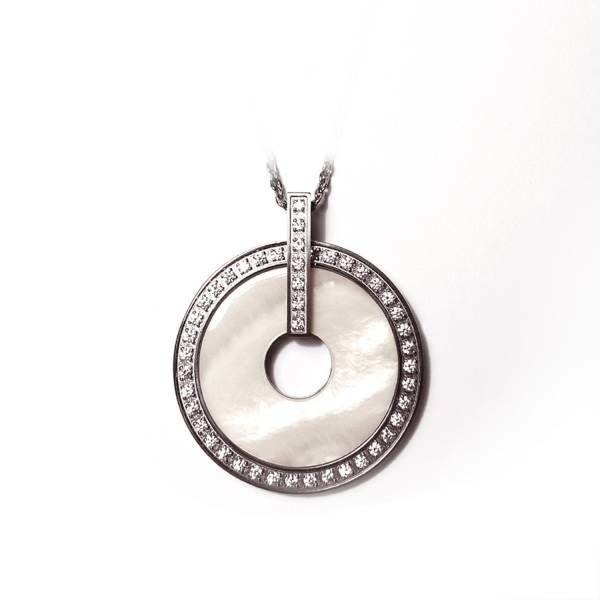 The jewelry of La Jolla is made of pure titanium and love. The accessory with germanium and magnetite becomes a warming piece. Titanium: Titanium is a hard metal, which is highly compatible with human and allergic free. This metal is often used in stents, metal crowns and metal bones. Those who have metal sensitive skin can wear titanium jewelry confidently. It's light and low in electrical conductivity. When wearing it, it feels like nothing and it rarely triggers metal detector. Titanium is resistant to corrosion, you don't have to take it off when showering, having a hot bath or even exercising. You don't need to worry about fading, darkening colors, change of shape, which often happens to accessories made of other metals. Germanium is a rare metal. It's a semiconductor that releases negative ions when in the environment above 32 ° C and it will take away unstable free electrons from the human body. The tapered shape have more area that touches the skin, which will enhance the massage effect. Magnetite: Magnetite is recorded in “Compendium of Materia Medica” by Li Shi Zhen in Ming Dynasty. Today, it’s widely used in medical science and technology. In recent years, it has been used in accessories. Negative Ion magnetite is magnetic. It releases far infrared radiation and negative ion. Once registered, you will earn reward 300 P，Redeem now !